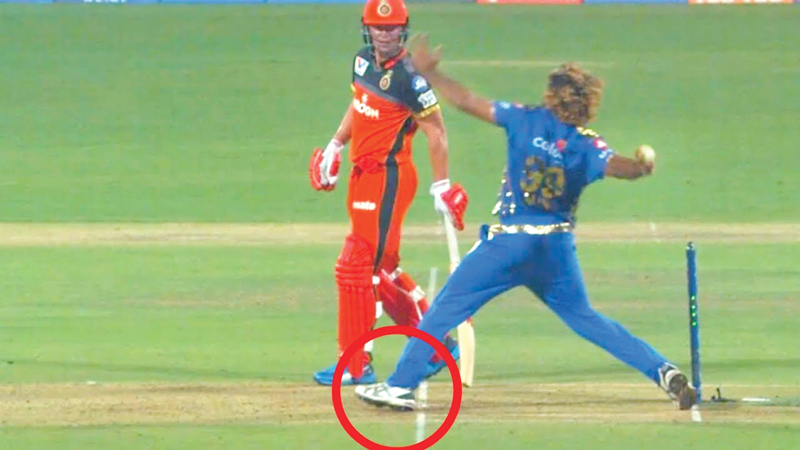 That controversial no-ball bowled by Mumbai Indians fast bowler Lasith Malinga against Royal Challengers Bangalore. BANGALORE, Friday - Cricketing greats backed Virat Kohli Friday after he slammed a “ridiculous” no-ball error which condemned his Royal Challengers Bangalore side to defeat against the Mumbai Indians in the Indian Premier League. Hosts Bangalore needed seven to win Thursday’s match off the final delivery when Mumbai’s Lasith Malinga bowled a dot ball -- but replays suggested the paceman had overstepped the line. “We are playing at the IPL level and not playing club cricket. The umpires should have had their eyes open. That’s a ridiculous call at the last ball,” India captain Kohli said, after the mistake was shown on the giant screen. “If it is a game of margins, I don’t know what is happening. They should have been more sharp and careful out there,” he added. On-field umpire Sundaram Ravi, India’s only representative in ICC’s Elite panel, was responsible for the missed no-ball in the Twenty20 tournament. Former England captain Michael Vaughan led calls for a technological solution to cut no-balls out of cricket. “In an era of so much technology and with so much at stake NO BALLS should never ever be missed,” Vaughan wrote on Twitter.